Families should look at the net costs, after financial aid of all types, when assessing potential colleges. Parents comparing college costs would be doing themselves and their kids a huge disservice if they just pay attention to listed tuition prices. What really matters is how much the school will cost you after financial aid and outside scholarships. And frankly some schools offer more scholarships than others…. Reyna Gobel offers a three-step method for getting started on a college list. 1. Have your son or daughter gather a list of 10 schools they’re interested in attending…. 2. Use the net price calculators on each school’s website…. 3. Talk to the high school counselor for your teen…. Net price calculators are imperfect estimators, so be aware of the cases where they are more likely to produce inaccurate results. Related: Are you eligible for a college tuition discount? Reyna Gobel, “Why Applying to Schools Based on Tuition Prices Can Cost Families Money”, Forbes, 8/31/2014. Are you eligible for a college tuition discount? How do you know if a particular college is likely to offer you a discount on their tuition price? Before you even apply, you can get an estimate by running your specific profile data through a Net Price Calculator (NPC), a tool that can be found on every college’s website. 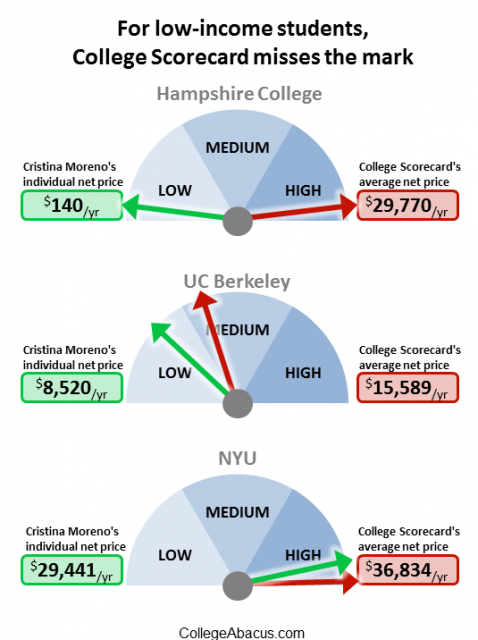 Forbes ran a Net Price Calculation for five schools using several hypothetical scenarios. The results show discount rates (financial aid) that would be awarded given specified parameters. … two types of students, one from a family with an annual income of $300,000 and another from a single-earner family making a mere $12,000 a year. We tested two different academic scenarios: a supersmart kid scoring 1540 on his SAT, with a 4.0 GPA and in the top 10% of his class, and a “B” student scoring 1250 on the SAT, with a GPA of 3.0 and in the top 50% of her graduating class. The biggest surprise is that RPI gives more financial aid to English majors than to engineering students. As you can see all the top institutions except well-endowed Amherst offer discounts or “merit” aid. Only Rensselaer Polytechnic Institute (RPI) differentiates its aid on its calculator by the student’s intended major as well as by income and ability. RPI clearly wants more poets and is willing to pay for them. President Nixon’s alma mater, Whittier College in southern California, clearly isn’t eager to attract lower-income students. In our test it offered an additional grant of only $1,334 to the low-income overachiever. Even after its ample discount, the needy student’s family still has to come up with half the cost of attendance. This illustration is a reminder that a Net Price Calculator can help guide your college search. Lucie Lapovsky, “What’s Your Tuition Discount?”, Forbes, 7/30/2014. In the college search and selection process, parents should think very carefully before assuring their child that “we’ll find a way to pay for it.” That promise could be the cause of deep disappointment or crushing student debt. In answering the question, “Should Students Apply to Reach Schools?“, Do It Yourself College Rankings discusses the pitfalls of applying to colleges that are financial reaches. The simple answer is not to apply to any college that you can’t afford to attend. The more detailed answer would be that it’s fine to apply to a financial reach school if everyone clearly understands that only significant financial aid would make matriculation possible should the student be accepted. But to avoid unnecessary disappointment and stress in making the final decision where to attend, one recommendation is to get a sense about the likelihood of receiving financial aid by running the Net Price Calculator tool very early in the process. Also consider the realistic chances of merit aid, which is often not included in the NPC estimate. For more insight on what makes sense for your family when deciding whether to apply to a financial reach, check out the complete DIY Rankings answer. That question has to be high on the list for a high school student creating a list of colleges she’d like to attend, and the Net Price Calculator can help in answering that question during the early stages of the college search. While it’s fine to stretch aspirations in considering a dream college that may be a financial reach, it’s important to be realistic in understanding practical budget limitations. Harvard University: It’s a reach for almost everyone because chances for admission at this Ivy League school are small at only 6%. Syracuse University: A private university with a 50% acceptance rate that is attainable for many students. Binghamton University: One of the top New York state universities, it comes with a 43% acceptance rate. Here are simplified NPC scenarios showing Net Cost of Attendance (COA) based on earned income levels of $50,000 (low income), $80,000 (medium income), and $150,00 (high income). Useful information, right? This chart illustrates the oft-repeated advice that in some instances a private college may be as affordable as a state school. No merit aid is included in the estimates. Some schools do attempt to include merit aid as part of their NPC estimate. These are simplified, streamlined financial scenarios. Real-life financial data is typically more complex. These estimates are not guarantees by any stretch of the imagination, and may be considerably inaccurate for business owners and other relatively complex situations. At what income level does a family’s chance of aid become zero? At an income level of $250,000, the net price of attendance in all these scenarios equals the gross price. In other words, somewhere between an income of $150,000 and $250,000 is the point where a family would not qualify for any need-based financial aid. The advice? Run a NPC early on in the process to get a general idea about a college’s affordability. The following questions can have a significant impact on college costs, especially the out-of-pocket cost, and on evaluating the financial aid award letter. Does the college meet the full demonstrated financial need for all four years, or is there unmet need (a gap)? How much on average do the college costs increase per year? Does the college practice front-loading of grants? Can students expect to receive a similar amount of grants in subsequent years, assuming their financial circumstances are similar? If the college practices front-loading of grants, how much will the grants change each year? What is the college’s outside scholarship policy? How does the college reduce the need-based financial aid package when a student wins a private scholarship? Does the scholarship reduce the loan and work burden (and unmet need, if any) or does it replace the college’s grants and scholarships? What are the residency requirements for in-state public college tuition? How many hours will I need to work to earn the full work-study award I’ve been offered? How much will I be paid per hour? Are work-study jobs readily available, or are they hard to get? What are the requirements for keeping my grants and scholarships in future years? Do I need to maintain a minimum grade point average? Do I need to take a particular number of units? Do I need to participate in any special activities such as community service? How does one appeal for more financial aid if the financial aid award is insufficient or the family’s financial circumstances have changed? What percentage of first-time, full-time students graduate within a normal timeframe? How many years, on average, does it take to earn the degree? What percentage of students graduate with debt and what is the average cumulative debt at graduation? These questions highlight some of the most critical issues that should be considered in determining how the net cost of college will be affected by financial aid. Here’s a suggestion on how a family can proceed with educating themselves about a particular college’s costs. Run a school’s Net Price Calculator using the family’s specific financial information. Review the school website to find answers to the ten questions listed above. Contact the school’s financial aid administrator to get answers not found on the website. Going through this process will uncover key financial information, providing a good sense of that school’s affordability. Net price calculators are not accurate for business owners and other situations. For some families (e.g. divorces/separated, business owners) using the Net Price Calculator will be less reliable because of the complexity of their family financial circumstances. The calculator is not intended for international families…. The general message is that if your family’s financial circumstances deviate from a “typical” situation, the simplified NPC calculations are less likely to predict your cost to attend college. In the case of business owners, schools usually will ask for additional financial information, which often results in revenue that had been netted out being added back in for the purpose of determining expected family contribution to college costs. Net Price Calculators have been required since 2011. Even with its flaws, the Net Price Calculator (NPC) offers low-income students a better indication of college affordability than the College Scorecard does. However, sometimes finding a college’s NPC is not easy. Because it uses average net prices as a measure of affordability, the recently introduced College Scorecard may discourage low-income students from applying to high-priced schools. Low-income students do not pay “average” prices. For that matter, high-income students don’t either. There’s just one problem: no student is average. Consider a low-income applicant to the University of Pennsylvania, a school with a high sticker price. At Penn, a full-price student pays $59,600 (including tuition, room & board, and other fees) and a low-income student with a full scholarship pays $0. The average net price across these two students is $29,800. (As it happens, Penn’s reported average net price is $20,592.) Just like high sticker prices, high average net price can mislead students from modest circumstances looking for affordable college options. Many colleges – particularly prestigious schools with high sticker prices – are committed to building socioeconomically diverse student bodies. At such schools, students’ individualized net prices can vary significantly depending on their financial circumstances. NPC figures offer a better measure of affordability. … Like the College Scorecard, NPCs offer key financial information to students and families prior to application and matriculation. The College Board’s 2012 study revealed that more than half of college-bound seniors from lower-income and middle-income families still rule out colleges on the basis of sticker price, but with the advent of NPCs, students from all backgrounds can identify affordable college options before they decide where to apply. For low-income students like Cristina, the College Scorecard misses the mark – sometimes by a big margin. As with sticker prices, these average net prices can indicate to low-income students that they will find neither financial support nor a warm welcome at selective schools. But NRC calculators are often not user friendly. A report issued by The Institute for College Access and Success (TICAS) in October 2012 asserted that “net-price calculators are still not reliably easy for prospective college students and their families to find, use, and compare,” noting (among other issues) that many schools post NPCs on obscure web pages. Although NPC links are included in both the College Scorecard and the Department of Education’s College Navigator, it turns out that many do not connect to the right location. A solution: College Abacus will soon have a consolidated set of links to all NPCs for U.S. colleges and universities. At College Abacus, we are closing the gap between legislation – and its goals – and the actual needs of students, parents, and counselors around the United States. We are taking on the task of aggregating the net price calculators into a single, student-friendly tool. With the help of a grant provided by the Gates Foundation’s College Knowledge Challenge, we expect College Abacus to expand from its current group of 4,000+ schools to include all US colleges and universities by September 2013. Although college “sticker prices” have soared over the last few years, net prices have experienced a more modest increase. … For the average full-time student, net tuition – which subtracts grants and tax-based aid – is less than half of the published price at private nonprofit four-year schools and less than a third of the published price at the typical public four-year institution. Moreover, trends in sticker prices and net prices have diverged over the past several years, such that many students are actually paying less now to attend college than they would have five years ago. That’s all well and good, but for the one-third of students who are paying full price, the positive news about net prices is small comfort. And for the two-thirds of the class of 2010 who graduated with an all-time average high of $25,250 in loans, the grants and tax benefits are not shielding them from reality of rising college costs. Many students and their families consider only published prices when comparing colleges, without taking financial aid into account. It’s not surprising that the complexity of the financial aid formulas confuses many families, leading them to assume the worst when considering college costs. While it’s still too early to know, we can hope that the recent introduction of Net Price Calculators on all college websites will enable families to get a more realistic estimate of their net college costs. Here are some practical tips for using Net Price Calculators, a tool that is a useful first step in comparing affordability among the various options during the college search process. Eventually, the Department of Education is planning to post all net price calculator URLs on its College Navigator tool (http://nces.ed.gov/collegenavigator/). We will update these tips when we find out more information about when the URLs will be posted. The most important number on the page is the “net price” – the full cost of attendance minus grants and scholarships. Make sure you focus on that dollar figure when interpreting calculator results and comparing colleges. Some colleges also subtract their expectations of how much you’ll earn and borrow to get a smaller cost figure, but it won’t be called “net price. Remember that grants and scholarships don’t need to be repaid, while work expectations must be earned and loans repaid with interest. That’s why work-study and loans are called “self-help.” You don’t want to accidentally compare one school’s net price with another school’s figure that includes loans and work-study.